“Assalamualaikum, yin dee dtôn ráp!” a senior facilitator greets during a rub nong — the welcoming of the new students. The Orientation Week, as it is commonly known around the globe, marks a significant flag off for the freshmen. It is objectively designed beyond breaking the ice: the activities are arranged to help the students to adapt to their new journey and phase in life. However, during the Orientation week, this particular activity conducted by 1,500 students from Prince of Songkhla University, Pattani Campus, brought about a much bigger agenda and hidden intention. It was an early morning in August when the management of the university commenced the ‘Sri Trang’ activity and it was participated by students from various localities in Thailand. During this activity, they had to take a 7 km walking tour around the peaceful Pattani city. They were accompanied by 500 facilitators who were well-informed about the great places around the Pattani Multicultural Ring Road. From the Wats of the Royal Monastery to the Old Palace of Pattani, to the market of the city and finally to Pattani Central Mosque, these students learnt about living in peace and harmony in a multicultural society. They also conducted some activities by the Pattani River. This insightful, beautiful activity would surely cause one to hope that more activities with such an objective be given a place in the Orientation Week. 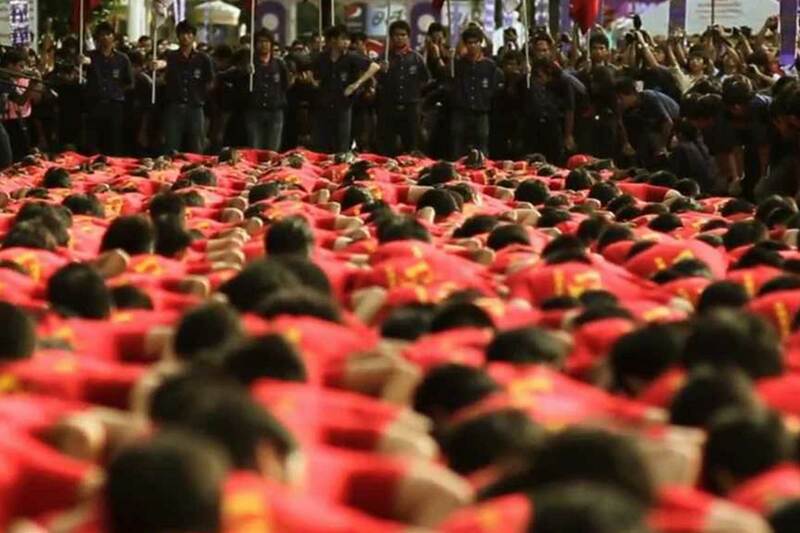 However beneath the gleaming surface lies a secret underneath – Thailand has borne witness to a more-than-50-year of hazing-based activities. The practice — which also could be referred to as SOTUS (seniority, order, tradition, unity, and spirit) — has seen multiple college initiation being turned into a platform of hazing and bullying. Recently, this practice was reported to have spread to even the high schools. The insurgency became worse when online footage was leaked in early June this year and it showed a Grade 10 student being forced to lie down and roll around. The authorities claimed that the video was demonstrating one part of the activities for senior-junior bonding and that the perpetrators have since regretted their actions. Some other more recent hazing activities that have captured the attention of the media include forcing to kiss the ground, crawling through a Khlong overnight, receiving beatings by seniors, having candle wax dripped onto bare bodies, and even being forced to commit sexual-related acts. Every year, a large number of students suffer from various injuries and consequently admitted to a hospital for hazing-related issues. A leukaemia student was even killed from a hazing activity back then in 2014, while another was unconscious for three days and almost died from drowning in an incident two years later. Fortunately, these incidents were brought to the attention of Thailand’s Ministry of Education and they are determined to fix things up. But it could take some time. Such practices of the SOTUS system is not just a violation of human rights and a humiliation of human dignity. It also goes against what has been permitted in Islam. Islam promotes the fundamental human right, for the sanctity of life and honour of mankind. Allah lists down the abuses people perpetrate and strongly warns us not to practise these injurious acts. By laying the foundation of brotherhood for all Believers, Allah makes it aligned with the goal of achieving Taqwa and His Mercy. Following that foundation is the borderline that should never be crossed by the brothers in Islam: no mocking and ridiculing of others, no slandering, no giving offensive nicknames, no backbiting, and avoiding negative assumptions. If the teaching of Islam is very thoughtful and compassionate that it guards the interaction among people to maintain harmony and be rewarded for it in the Hereafter, then surely such acts of harm and destruction like physical aggression and hazing activities are condemned in Islam. Islam calls for us then, to put a halt on any aggression occurring around us. Not only the young have to respect the senior, but the latter have to love the former too. And, it is because of the absence of love that all these aggression and oppression are taking place. Islam teaches people to plan a good future so that every aspect in life — both for the world and the Hereafter — would be appropriately organized. Islam is not against the colours of tradition, especially since the Land of Smile is so colourful with all its cultures. Islam pledges for unity too. The verse from the Quran “And hold fast, all together, by the rope which Allah (stretches out for you), and be not divided among yourselves” (Quran 3:103) calls for unity under the blessing of Allah. A spiritually strong person would surely make a great man. The Quran is full of motivating verses to strengthen people and mankind. The SOTUS, in its most fundamental principle, is a good concept. Aggression and oppression — the hazing — are not, and could not be used as a justification for achieving a noble goal. The new students of the university are going to step into a challenging world, and they need so much love and support to guide them through. Islam brings the message of love and in today’s world, we need the power of love now more than ever.